Invasive Brown Tree Snakes have extirpated almost all of Guam’s native birds, and the consequences are cascading quickly. The scales are tipping on Guam. The once thriving tropical rainforest, home to a great diversity of birds and other wildlife, is changing fast. The introduction of Brown Tree Snakes in the 1940’s has proved to be too much for the paradisaical biodiversity hotspot to endure. Snakes are predators adapted to prey on small animals such as birds and mice. They are globally distributed, including on some islands where they have evolved alongside fellow native wildlife and plants. In such circumstances, snakes and their prey hang together in a web of interactions that facilitates balance within the ecosystem—neither predators nor prey go extinct. Under a different set of circumstances, however, the presence of snakes on an island can send the native ecosystem into swift decline. On the Western Pacific Island of Guam, the invasive Brown Tree Snake has decimated native bird populations. Six of Guam’s native forest bird species have been extirpated (meaning that none remain on the island), one species and one sub-species is Extinct (exists nowhere), and one species and one sub-species is Extinct-in the-wild since the introduction of Brown Tree Snakes. That leaves just two native forest bird species on the island: the Micronesian Starling and the Endangered Mariana Swiftlet. Because Guam’s native birds did not evolve alongside the Brown Tree Snakes, they lack adaptations to defend themselves against the human-introduced predators. Had they evolved together, the birds would have developed mechanisms to protect themselves from the snakes well enough to reproduce at healthy rates. This process in which the fittest individuals survive and reproduce, is known as natural selection–it supports balances between predator and prey populations. Natural selection takes place over millions of years, but humans have the power to tip the scales over a few short decades. Such is the case on Guam, where sharp downturns in native bird populations are rightfully causing alarm. Because Guam’s native birds did not evolve alongside the Brown Tree Snakes, they lack adaptations to defend themselves against the human-introduced predators. Ecosystems are made up of complex connections between species, which means a disturbance to one part of the system can cause a chain reaction. For example, native wildlife contribute to the distribution and abundance of vegetation in their natural habitat. Vegetation likewise supports the livelihoods of the native wildlife. A recent study published in Nature Communications sheds light on how the disappearance of most of Guam’s native birds has consequences for the island’s vegetation–specifically, trees that produce fleshy fruits. What is seed dispersal and why is it important? Seed dispersal is the transportation of seeds away from parent plants. In Guam, native birds disperse seeds by eating fruit and then excreting the seeds. The digestive tract breaks down the outer coat of the seed, a process called “scarification.” This gut passage prepares the seed to sprout and grow. Now that most of Guam’s native bird species are gone, fewer seeds are benefiting from this process. Seed dispersal is the engine that keeps the forest running. It’s a subtle process that most people don’t think about, but it turns out to be critical for maintaining a healthy forest. As the native species of an ecosystem disappear, the relationships that stabilize the ecosystem begin to fail, and the system of balances is liable to tip. Unless conservation intervention is carried out in Guam, the recent wave of bird extinctions will crash on the shores of a biologically impoverished island. As the native species of an ecosystem disappear, the relationships that stabilize the ecosystem begin to fail, and the system of balances is liable to tip. The story continues down an even more frightful track. One of the unexpected consequences of the introduction of Brown Tree Snakes is the uncontrolled proliferation of spiders. Because most of Guam’s spider-eating birds are gone, native and non-native spider populations are booming. What was once a lush island filled with singing birds and fruit trees is now an increasingly quiet–until you hear the shriek of a hiker who has just walked through a spiderweb. Arachnaphobes and ophidiophobes are advised to steer clear of this unnerving purgatory teeming with spiders and snakes. The new study highlights the ecological connectivity between wildlife and plants, as well as the vulnerability of island ecosystems to invasive species introductions. Invasive species impacts disrupt the patterns of species interactions that were refined through evolutionary processes over millions of years. The initial disturbance represents just the beginning in a series of cascading events. Research findings clearly indicate the importance and urgency of removing invasive species from island habitats, where ecological consequences unfold rapidly. In many cases, conservation intervention is the only way to prevent extinctions on islands where invasive species are present. In many cases, conservation intervention is the only way to prevent extinctions on islands where invasive species are present. The transformation of Guam from a lush tropical rainforest with a diversity of birds to a snake and spider-infested habitat is particularly dramatic. But the concept is all too common. Islands around the world are changing rapidly due to introductions of damaging non-native species. The extinction pattern on Guam is a warning sign for islands everywhere–invasive predators need to be prevented from accessing islands, or removed if they have already been introduced. Islands with endangered or endemic species need intervention urgently. The extinction pattern on Guam is a warning sign for islands everywhere–invasive predators need to be prevented from accessing islands, or removed if they have already been introduced. Islands with endangered or endemic species need intervention urgently. Researchers and conservationists are working to control the invasive snakes on Guam. Where they can create “safe areas,” they hope to reintroduce Guam’s missing native birds from the surrounding islands where they can still be found. If these populations can take hold and stabilize, they can avert extinction and help to restore the rainforest of Guam through the natural process of seed dispersal. Then perhaps, the boom in bird populations can offer residents, tourists, and researchers respite from the spiders. Biosecurity and conservation intervention can make the difference between paradise and purgatory. For islands around the world, hope remains that conservation intervention can prevent further extinctions and tip ecological scales back toward balance. 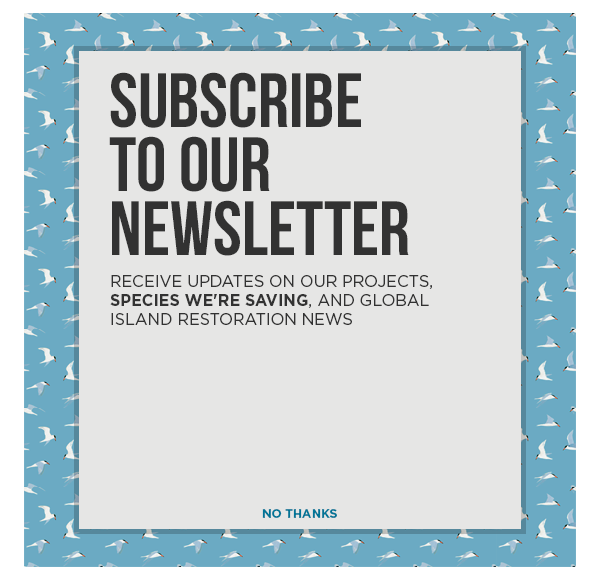 Whether an island ecosystem is under pressure from snakes, rats, mice, or another invasive species, quick and thorough restoration is critical to support biodiversity and prevent extinctions. The good news is, hope is intact. Guam could be changed from a quiet, faded landscape rife with spiders and snakes back to a lush tropical forest ringing with the sounds of a diversity of native birds. We still can choose feathers over scales, and tip Guam’s ecosystem back toward balance.